Inspired by this genius 3-ingredient pancake recipe from Buzzfeed, I decided to come up with another quick, healthy, protein-packed breakfast recipe to give my children plenty of energy in the morning. So I added blended oats to Buzzfeed’s interesting combo of banana, egg and cinnamon, and voila, these banana oatmeal pancakes were born. And you can use gluten free oats if you want them to be gluten free. The texture is definitely a little different to regular pancakes because of the high egg content and lack of raising agent. But with almost 4 grams of protein per pancake, this recipe produces a great breakfast food for those of us who don’t generally like to eat eggs for breakfast (that’s me). And if you are not yet convinced, my 5 year old who barely eats just gobbled up three of these banana oatmeal pancakes and yelled for more. That is unheard of in our house. *Edit – some people have commented that these pancakes are great with a scoop of protein powder. So if you want to increase the protein content even more, why not try adding a scoop of this Garden of Life Organic Vegan Protein Powder or this PaleoPro Protein Powder . Put the banana in a bowl and mash with a fork. Put the oats in a blender and blend until fine. Add the blended oats and cinnamon to the banana mix, and stir well. Heat a skillet over a medium heat with a dash of vegetable oil. Pour ¼ cup of the mixture into the skillet, cook on one side for about 1.5 minutes, then turn and cook on the other side for about 1 minute (or until golden brown on both sides). Serve (with or without maple syrup) and enjoy. These look delicious! Always trying to find new ways to make breakfast interesting and include eggs! This definitely will be a great alternative on weekends! I’ve tried these, using steal cut oats, all I had. But added blueberries! Hi Tascha. Thank you for your comment. I’m glad to hear you enjoyed them, and that they work with steel cut oats as well. I’ll have to give that a try. do you have to put them in the blender if they are steel cut. I haven’t tried using steel cut oats, but I would think you could avoid blending them. You might want to soak them in boiling water for 5 minutes before using them though. That would soften them slightly. Used banana In the mixture and walnuts and strawberries as a topping. That’s so great! Walnuts and strawberries on top sounds delicious! Thank you for your comment. Best recipe I’ve tried thus far and have tried several with almond flour and coconut flour (total losses). Maybe I could try as substitute for oats. Query: I thought oats are gluten free. Technically oats are gluten free, but they are often contaminated with gluten due to manufacturing practices. So to be sure, you need to buy gluten free oats if you have celiac disease or a gluten sensitivity. OMG! this recipe definitely needs salt. The pancakes taste great but they are so plain. A sprinkle of salt will make it perfect. Hi Jacqueline. Thank you for your suggestion. I’ll be sure to give it a try. I just made these this morning as I’m trying to find healthy alternatives to favorite dishes i.e. pancakes. Followed exact recipe and it was very bland. I think salt will take it a long way. I cracked some Himalayan pink salt on top after my first bite and what a difference! Should maybe be included in the batter before cooking. My boyfriend drinks oatmeal banana smoothies almost daily and he wasn’t too crazy about these. Granted he puts almond milk in it. I think almond or vanilla extract could help too. I’ll try again with these modifications and let y’all know! Aww how nice! I love that they inspired childhood memories. Hmm bread and butter pudding. Yum 🙂 Thanks for your kind comment! I like these a lot with some adjustments. I added a 1/4 t of baking powder, 5 roasted pecans, 1 egg and 1 egg white, and some salt to taste. They came out really good. Next time I’ll use some ripened bananas so that I won’t have to use syrup. Thanks for sharing! Do you have the nutrition breakdown for these? So good, thank you for the recipe! Hi Amber. Thank you for your comment. I’ve updated the post to include a nutrition facts label. I hope that helps. Do you think the consistency would work with using flax egg instead? My son is alerting to eggs. Hi Patricia. I have not tried it with flax egg, but I did just try it with chia seed egg (very similar to flax egg). It worked really well. I just replaced the 2 eggs with 2 tbsp chia seeds and 6 tablespoons water. I mixed the seeds with the water in a small bowl and let that sit for 5 minutes before adding it to the rest of the ingredients. I did not grind the seeds before using them so they were visibly noticeable in the mixture, but you could grind them. The mixture was a little thick so I had to pat it down into pancake shapes in the pan slightly, but the end result was great. I assume it would work with flax egg as well. I will try it and get back to you. Thank you for your comment. Actually the recipe says to use 1/4 cup of the batter, not 1/4 of the batter. There should be about 1 1/4 cups of batter in total, so that ends up making 5 pancakes of around 1/4 cup each, give or take. It will depend on how big your banana is as well. My banana is very big. Should I alter the recipe? Hi. I just saw your post, I was thinking it means a quarter cup of batter per pancakes. What tracker do you use to determine the nutrition facts if you don’t mind me asking? Hi Kristin. Thanks for your comment, and your question. I use a combination of sources to calculate the various nutrient contents, and then I add them to a nutrition label app on wordpress. Eat them regularly now, definitely a keeper, thx! So glad to hear that John. Thanks for the feedback. Can you make ahead, and then freeze them? Was thinking they would be great to be able to grab when running out the door. Thinking you can put them in the toaster to re heat. Yes absolutely. Great idea. I often freeze homemade pancakes and pop them in the toaster to defrost. I just place them in a single layer on a baking tray to freeze. Then once they are frozen I transfer them into a freezer bag for storage. These are yummy and my 19 month old loved them. Thank you for the tasty, quick, healthy, breakfast idea. I’m so glad you and your 19 month old liked them Danielle. They are a hit with my children too. Thank you for your comment. Mine have never looked like yours here. They are hard to flip and just flop but still tastes good. Any ideas on that? I’m glad yours taste good, but sorry they are hard to flip. My 3 thoughts are: (1) are you using a medium sized banana and large eggs? If your eggs are too small or your banana is too big they won’t hold together as well as they should. (2) Are you cooking them long enough on the first side before flipping them? You might need to cook them a little longer before trying to turn them over. They should be a little brown. (3) Are you using a little vegetable or coconut oil in your pan to stop them from sticking? If these tips don’t help, come back to me and we’ll see what else might be going wrong. I have found your recipe in a German online newspaper a couple of days ago. This morning I have tried these pancakes and they really taste delicious. I was unsure about the quantity of oatmeal, as this has not been mentioned clear enough, so after tasting the pancakes, I searched for your website and instinctively took the approximate amount. Thank you very much for sharing this tasty breakfast alternative and please excuse me, should my english be not that perfect, as it is not my native language. By the way, I can definately say that preperation is so fast, that I plan to make these pancakes on weekdays as well. This recipe was a hit! My three kids gobbled them up, I tripled the recipe and mixed everything in my vitamix. I also added extra cinnamon and some allspice for extra flavor, and then microwaved berries to release their juices and used that as a syrup with some mint leaves and sliced almonds. Thanks for the recipe, we will be using regularly! I’m planning on doing this pancake this weekend. I hope I like it. Thanks a lot. Made these this morning and my kids ate them up and didn’t even ask if they were “different”. Love them and will definitely make them again! I fallowed the recipe and the turned out perfect. Thank you so much for your comment Sabrina. I’m glad you and your kids liked them. I’ve made these twice, with the second effort going much better than the first. (I poured the batter too big the first time.) The texture reminds me a bit of the sourdough pancakes we had on an Alaskan vacation. Also, I think getting the size right makes a huge difference in the taste/texture. Served mine with some failed strawberry freezer jam (which makes a perfectly fine sauce). Once I’ve used up that open jar, I’ll switch to some open maple syrup. Btw, if anyone happens to have done Isagenix, I found that the shake mix scoop is about the perfect size for 1/4 batter (1 pancake). Thank you for your comment. I haven’t tried making it in advance. My guess would be that you could probably prepare the egg/banana part the night before and store it in a covered container in the fridge, then mix it with the oats right before cooking. I wouldn’t store it too long though. I’m right there with you on trying to make breakfast as fast as possible. It’s so easy to go for an unhealthy option if healthy takes too long. Good luck, and I’d love to hear how it works out if you do try making it in advance. My baby boy loves these pancakes. 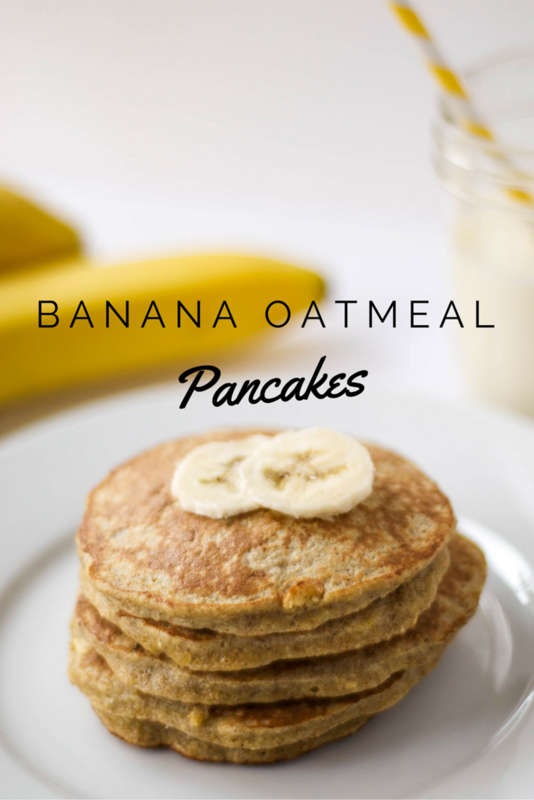 Instead of using oats though I substitute baby oatmeal and they turn out great! Thanks for the great recipe! Hi Christie. I’m so glad to hear your little boy likes them. What a great idea to use baby oatmeal! Thank you for your comment. These were amazing!! Thank you 🙂 I added a little lemon zest and ground the oatmeal in a coffee grinder to get it extra fine. Ooh lemon zest. What a great idea. Thanks for letting me know. I’ll have to try that. Thank you so much for sharing this recipe. My 5 year old loves these. I have been making a couple batches in advance to freeze and I will warm them up for a quick, healthy breakfast before school. Your method sounds amazing. I’m going to have to give it a try. Thanks for your feedback Karl. These were great! Really easy and very tasty with a bit of maple syrup and whipped cream. Both kids liked them, and I am happy to get some protein in all of us – my 5-year-old is very hard with protein right now. Thank you! Will be making these again. Hi Alissa. Thank you for your comment. I’m so glad you and your kids like them. I know what you mean about 5 year olds and protein. Mine would eat white carbs all day if I let them! I substituted the eggs for unsweetened applesauce and added blueberries to mine for my Daniel Fast I’m currently doing and they are absolutely delicious! I may try with natural almond or peanut butter for the protein. Thanks for sharing! Omg these were sooo good! I had them with a little raw honey and unsalted almond butter on top… delicious!!! Oooh that sounds really yummy. I’m going to have to give it a try! OMG! These were amazing. Just perfect…..wouldn’t change a thing. Naturally sweet. No need to add anything. I only topped it off with fresh berries. These were amazing. Too amazing I should say as I ate the whole recipe myself in one sitting! Used 1 tsp of ghee to coat the pan. Added maple syrup. This is perfect. Would not hangs a thing. I am so glad you enjoyed them Jen. Thank you for your lovely comment. They are a favorite in our house too. Didn’t capture the rating so adding now! I’ve been making these for years. If you want to boost the protein and lower the carbs, ditch the oats and add a scoop of whey protein powder instead. I also add a dash of vanilla extract, a dash of cayenne pepper, and sprinkle of dark chocolate chips. This is great as a pre or post workout bite. Quick question, as I would like a really good pancake recipe using all of these ingredients and some added protein powder. If I just added a scoop of protein powder and maybe some almond milk would my consistency still be good? I’ll have to try it out, but I don’t want to add too much or too little of one thing. What do you think may work? Thanks for the recipe! Very excited to try. I would try just adding the protein powder first, without the almond milk. If you add one scoop it should still work out fine. In fact, someone on Pinterest commented that they did just that and it worked out well. If you find the mixture gets too dry, you could add a dash of almond milk, but I wouldn’t add more than 1 to 2 teaspoons, otherwise the batter will be too runny. Good luck. I hope it works out. I’d love to hear how it goes. Yum! Eating these now. I just put everything in the magic bullet, and blended it for 30 seconds or so. I let it sit to rest for about 5 min before cooking. The first couple of pancakes were a little tricky, but then I got the ratio, heat and time just right. Yummy Love these! Made a double batch of these this morning for my 1yr old and he loved them. Ate 2 1/2 pancakes like it was nothing. My wife and I ate a bunch after our morning workout. Great recipe for all ages. Will definitely make again and pass the recipe on to others. Thank you so much for your comment Mike. It’s always great to get feedback. I’m so glad you all like them. These pancakes are even a hit with my very selective eating 3 year old. These are so delicious! I have one question, is this recipe for a single person? I’m so glad you like them! The recipe makes 5 pancakes – a total of about 350 calories. That would be fine for one person for a fairly substantial breakfast, or you could share the recipe between two as a snack or part of a meal. Delicious! i added a pinch of baking soda just so they fluff up, and also added some chocolate chips. absolutely yum! I cook these in my waffle iron and they turn out perfect! My first try. I thought the batter was a bit too thick, so I added % fat yogurt. They were so delicious! Can’t wait to get more bananas so I can have them again. I’ve made these a few times already. Just added a bit more cinnamon and a drop of vanilla extract. I’ve added chopped walnuts once and slivered almonds another time. And once when I was feeling indulgent, about a tablespoon of mini chocolate chips. Yum! Thank you for the recipe! For anyone considering making these– do it! The texture is a like the love child between french toast and pancakes. The recipe is super forgiving (I’ve messed it up in various ways and it always turns out delicious anyway). Great way to use up lots of bananas. Really tastes and feels like breakfast comfort food but it’s nice knowing that you’re getting a good hearty, nutritious start to the day. Keeps well in the fridge for at least 4 days (even big batches disappear by then, anyway, so I don’t know after that). I highly recommend them with chopped walnuts, wild blueberries and serve with greek yogurt and maple syrup. Adding a 1/4 tsp of vanilla extract and a tiny pinch (1/8 tsp or less) of nutmeg is pretty yummy, too. To the OP – Thank you so much for sharing this recipe! It’s become a huge household favorite for weekend brunch and I’ve been making big batches to keep on hand for weekday breakfast. Thanks for sharing this recipe. I added a teaspoon of maca, two teaspoons of chia and blueberries. MY friends said they would not trade the original pancakes for this! These are the best oat pancakes I’ve had! 1. Is the cholesterol of 25% not too much for a 4 year old child? 2. Can it be used as lunch? Hi there. Thank you for your questions. (1) 25% cholesterol is not too much for a 4 year old. The cholesterol comes from the egg, and eggs are a very healthy addition to any diet. The cholesterol we get from our food has very little effect on the cholesterol levels in our bodies. Our body actually makes cholesterol as well because we need it. (2) Yes these can be used at lunch, as long as your daughter is happy to eat them cold (I know mine loves them cold). Just make sure they don’t get too warm during the morning in her lunchbox. I hope you enjoy them. If you have any more questions I’ll be happy to answer them. Thank you for listing the nutritional value but this recipe does not serve five! Thank you for your comment, and sorry for the confusion. You are right – this does not serve 5 people unless they have very small appetites! I wrote the recipe in that way so that I could show the nutritional value of each pancake. I didn’t mean that each person would only eat 1 pancake. I should edit it to make it clear. Thank you for pointing it out. These are fantastic, I replace one egg with 1/4 cup of liquid egg whites and add a pinch of cinnamon and salt. I always use a slightly underripe banana and let the batter sit for a few minutes while I preheat my pan and find the consistency perfect for flipping. Thanks for the delicious recipe! I tried out the recipe this morning and turned out great, my only problem was that they would get burnt quickly. i tried it over low heat, i got that nice pancake brown color but had difficulty flipping sometimes. the underside would be cooked but the surface wouldn’t be ready for it to be flipped over. so thats one thing. the other is that i just wanted to make sure of the texture. is it supposed to be a bit mushy? or did i just under cook that? thanks alooot for the recipe!! i’m pregnant and trying to substituter my sweet cravings for healthier ones. I is that there always moist in the middle.,. Any suggestions??? These are awesome as Swedish-style oven baked pancakes. Make a 5x recipe, pour in buttered 9×13 pan and bake 18 mins at 450 F. I add chopped walnuts and wild blueberries. Cannot imagine 1 banana, 3 eggs, 1/4 c. oats can be enough for 5!!! I will try this for ONE and cut back the eggs to 2. Hi Sandy. I’m sorry for the confusion. I did not intend this recipe to be for 5 people, just 5 servings of 1 pancake each. I did that so that the nutrition facts label was per pancake. I imagine most people would eat 3 of these minimum. This was amazing. I have tried other recipes with eggs, bananas, and oats, but not this good. My boyfriend and I enjoyed this so much. I did tweak mine a little bit. I put a little coconut cream and some blueberries. I will forever keep making this! I love breakfast food, but traditional pancakes are not healthy. I enjoy this healthy alternative and tastes so much better, than protein pancakes. Thank you for your comments. I thought the blended oats would be preferable because then they are not so coarse textured, but I love your suggestion to use whole oats to reduce the wetness of the middle. Thanks. I’m going to give it a try. Thanks for the recipe. I tried them this morning and turned out well. I wonder if using egg whites instead of whole eggs would ruin the recipe? I may have to try that next time, maybe 1 egg and 2 egg white or 4 egg white and no yolk? Hi Kyle. I bet that would work. But you do know the yolk has loads of incredible nutrients, right? Maybe 1 egg, 2 whites would be a good compromise. Made the pancakes today with defrosted bananas. It was delicious, soooooo good! And the best thing is: it’s such an easy recipe. These are dealt good, and my kids love them! I added nutmeg as an additional spice, and it added a great mix of flavor. Is the calories for the 5 pancakes it makes or just one? I recently changed the nutrition facts label so now the calories are for all 5 pancakes, which is about 1 serving. Hello! This recipe is great EXCEPT for the fact that it does NOT serve 5!!! Barely serves 1 hungry girl. (I am not overweight by the way I am a very normal healthy eater). Intttteresting. Can I use quick oats for this recipe? If so, do I have to wait before cooking them? I had these for breakfast Ah maz zingggg. Totally loved them. Delicious and filling. Thanks so much for the recipe. This recipe has replaced my old traditional pancake recipe. Great as written. Have also experimented with adding berries, vanilla, chia seeds, etc. all with excellent results. I have also made larger batches to freeze. Thank you!! Oh i was iffy about adding the cinnamon because I’m not a big fan of it, but oh man I’m glad I did. I also added flax seed to this recipe and it came out completely perfect. Yummy and it is safe for someone with IBS. Delicious recipe! I topped it with some strawberries and pure honey! Thanks a bunch! Thanks for your kind comment Melissa. I tried this recipe today, and it was delicious. I liked the simplicity of it and the few simple ingredients. I had two bananas, so I used both. I basically doubled the recipe, but only used two eggs. The taste was great and it made a nice healthy and hearty breakfast meal. Thank you for sharing! Thanks for your comment. It’s good to know you can play with the amounts and still get a tasty result. 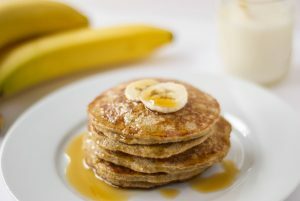 Found this recipe while looking for a sugar & dairy free pancake for my 3 yr old’s bedtime snack, it is perfect and she loved it! I did add a pinch of salt. I got five pancakes and one tiny one out of it. They cooked up well and flipped nicely. Will be bookmarking to make again and again, though it is so simple I think I’ll just remember Thanks!! I am new to this WW group and craving pancakes, how many Freestyle points are each pancake? Sounds yummy! This recipe was amazing. We were looking for recipes with food items currently on our meal plan and this was perfect. We are currently doing a cleanse which is vegan so we substituted the eggs for homemade unsweetened applesauce. I forgot to blend the oats but I leg them soak in the batter mixture for a bit before cooking them. We added blueberries too. These were great!!! I modified with a third egg. But dangit! I forgot the cinnamon!!! My bad. Thanks for sharing this recipe. It’s a winner. Amazing. These have become a staple in my house, my 4 yo son asks for them ALL of the time. I love the texture, think and light like a crepe. Thank you for this recipe! My 19 month old is a very picky eater. She loves all the ingredients, but this was a fresh take on them. I also threw in some flax and chia seeds, and she ate almost the whole batch! I also did a pinch of baking powder in the batch, and used honey as a topping. I wouldn’t keep it more than a day due to the raw eggs and the browning bananas. These were absolutely delicious! I was really hesitant on making these and searched all over until I found what I thought would be the perfect recipe. This was it! By the way, I used a quarter cup to measure and came out with five pancakes. I also added a smidge of vanilla, but that’s it.